The Maryland State Fair is the annual state fair for the state of Maryland. It is held at the Maryland State Fairgrounds located near the intersection of York and Timonium Roads in Timonium. As of 2006, the fair is an 11-day event customarily beginning in late August and ending around Labor Day. The first fair was held in 1878 and was known as the Lutherville Fair. The following year, 1879, the fair was moved to its current location in Timonium and was held from September 9 through September 12. In 1906, the Lutherville Fair merged with the Pimlico Fair and became known as the Maryland State Fair. The fair was suspended from 1943 through 1945 during World War II. In 1999, the fair grew to its current length of 11 days. In 1878, after several unsuccessful attempts to establish an on-going fair at other locations around Baltimore, a group of Maryland businessmen operated a successful fair on a 4-acre (16,000 m2) site in Lutherville, MD. Despite its success, the Lutherville Fair was short lived because an extension of the Northern Central Railway was constructed in the middle of the fairgrounds. Their success in Lutherville, however, gave the operators resolve to establish an annual fair, and in December 1878, they incorporated as The Agricultural Society of Baltimore County. The corporation leased a 37-acre (150,000 m2) plot of land on the York Turnpike on what was then known as "the Timonium Estate." The first Fair at its new home was held September 9-12, 1879. The Northern Central Railway, cause of the closing of the Lutherville Fair, was now the primary source of transportation for fairgoers from Baltimore to the Timonium Fairgrounds during the rest of the century. Other fairgoers walked or rode horses, wagons, carriages, and carts to the fairgrounds using the Turnpike. Late in the century, The Agricultural Society of Baltimore County faced stiff competition from the Pimlico Fair, also referred to as the State Fair. Ultimately, the two groups held joint fairs in 1894 and 1897, and in 1906, merged to form one corporation - the Maryland State Fair and Agricultural Society of Baltimore County, Md. Their annual Fair became known as The Maryland State Fair. The early years at the Fair saw tents and wooden structures in use to exhibit home arts, farm and garden products, and livestock shows. Plowing and working oxen competitions were some of the popular but few attractions. Races were held at the track, and results were forwarded to interested horsemen at Baltimore and Alexandria, VA, by way of carrier pigeon. Food concessions consisted of sandwiches made by the farmers' wives, and amusements involved sideshows, sack races, and greased pole climbing. The Maryland State Fair grew and prospered, adding many attractions and exhibits, including an airmail delivery at the 1918 Fair. The annual event continued until 1943 when the Fair was interrupted because of the war effort. The fairgrounds were leased to the U.S. Army for a storage depot and a vehicle repair center. After a three year absence, the Fair reopened it gates in 1946. In the 1950s growth in Baltimore County flourished, and certain business interests wanted to purchase the fairgrounds site for industrial development. The majority stockholder of the Corporation, the Maryland Jockey Club, agreed to sell. However, a group of agriculturists, business leaders, horsemen, and bankers formed the "Save the Maryland State Fair Committee." The Committee raised over $600,000 to purchase the fairgrounds, ensuring that The Maryland State Fair at Timonium would continue to be Maryland's premiere event at the end of each summer. Another crisis was averted in the 1970s. 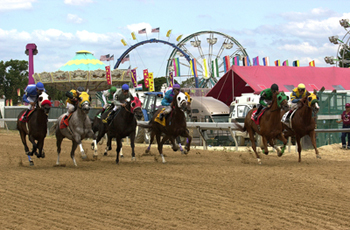 The Maryland Racing Industry took steps to have the Fair's Thoroughbred racing dates transferred to other Maryland tracks. Fair Directors recognized that such a move would threaten the survival of the Fair. The "Committee of Friends of the Maryland State Fair" was established to strengthen the cooperation between Maryland agriculture and horse breeding interests - a relationship that had been a tradition in the State since the mid 1700's. The Committee was successful in convincing the public and the Maryland Legislature of the value in keeping Thoroughbred racing a part of the Fair. The Committee also prepared expansion plans for the Fair, which resulted in a $5 million grant from the State of Maryland for building, modernization, and year-round use of the fairgrounds. One of the most famous horses to race at Timonium was the Maryland-bred colt Bee Bee Bee who competed and won here in the fall of 1971 then in May of 1972 at Pimilico Race Course won the second leg of the U.S. Triple Crown series, the Preakness Stakes. Currently the racetrack hosts events during the fair, including the Alma North Stakes for fillies and mares and the Taking Risks Stakes. In its long and colorful history, the Maryland State Fair has grown from 37 acres (150,000 m2) to over 100 acres (0.40 km2). Because of a commitment to continually improve and expand the event, Fair organizers found that they could no longer squeeze in more entertainment and attractions in what had become the traditional 10-day run. Thus, in 1999, the Fair added a day, making the Fair an 11-day event. The more than half-million visitors each year attest to what has become a favorite summer tradition - The 11 Best Days of Summer - The Maryland State Fair. In 2009, the fair runs from August 28 through September 7.